The Psalms was the single most important Old Testament biblical book in a monastic community: psalms formed part of almost every service and mass, every day. It is therefore natural that the Psalms received special attention from medieval commentators, and several commentaries on the Psalms were written in the 12th century. This copy of a very rare text comes from the Benedictine abbey at Ramsey, about 10 miles north of Huntingdon in Cambridgeshire. At the end of the volume is a table of Virtues and Vices, starting with Pride and Humility, and ending with Luxury and Charity. 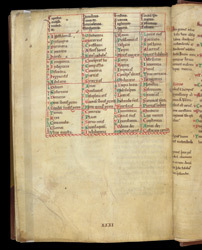 In the lower margin is the quire number 31 in roman numerals: XXXI.